The workshop that started it all is back and better than ever! Please scroll down for full description. If you are registering a group of participants, if you need a purchase order or invoice, if you want to pay by check or if you prefer to register by phone, please email Celena at info@UnderstandingNutrition.com or call 214-503-7100. She can also make arrangements for you to pay your registration fee in installments and reserve your place with a partial payment. EATING DISORDERS BOOT CAMP: NEXT GENERATION is the premier training workshop to bridge the gap between academic research and the practical tools you need right now to help your patients and clients. Unlike typical conference sessions where the topic is totally pre-planned and only a few minutes are set aside for questions, EATING DISORDERS BOOT CAMP: NEXT GENERATION provides a truly interactive framework in which the needs of the participants always direct the course. Every EATING DISORDERS BOOT CAMP: NEXT GENERATION is different, and topics are determined by the areas of practice and specific concerns brought forward by attendees. Whether you have been in practice a short time or many years, if you spend your day helping individuals with dysfunctional eating (and who doesn't?) 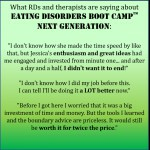 then EATING DISORDERS BOOT CAMP: NEXT GENERATION is for you. If you need a confidence boost, an update on the latest and greatest, confirmation that you're "doing it right," or the nuts and bolts of eating disorder treatment, reserve your spot in one of the upcoming locations for the most comprehensive and practical workshop you will attend. "I don't know how she made the time speed by like that, but Jessica's enthusiasm and great ideas had me engaged and invested from minute one... and after a day and a half, I didn't want it to end!" "I don't know how I did my job before this workshop. I can tell I'll be doing it a LOT better now." "Before I got here I worried that it was a big investment of time and money. But the tools I learned and the boundary advice are priceless. It would still be worth it for twice the price." Copies of both of Jessica's books, The Eating Disorders Clinical Pocket Guide, Second Edition and The Academy of Nutrition and Dietetics Pocket Guide to Eating Disorders, Second Edition. One and a half days of PERSONAL attention from Jessica - Eating Disorders Boot Camp: NEXT GENERATION workshops are limited in size to ensure that you get exactly what you need. P.S. - Don't see a location that fits? All you need to bring ED Boot Camp to your area in 2018 is 10-12 interested attendees and a room to accommodate them for two days! Get in touch with Celena at info@UnderstandingNutrition.com or 214-503-7100 and let's make it happen! We thought you would be interested in these related items. 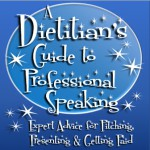 A Dietitian's Guide to Professional Speaking: Expert Advice for Pitching, Presenting & Getting Paid! Copyright 2019 © UnderstandingNutrition.com. All rights reserved.